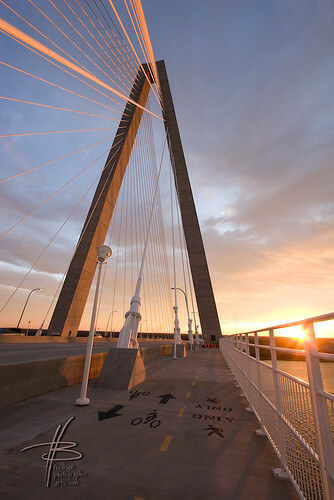 I took a trip down to Charleston to shoot the sunrise from this beautiful piece of art in itself, the Arthur Ravenel Jr. Bridge. 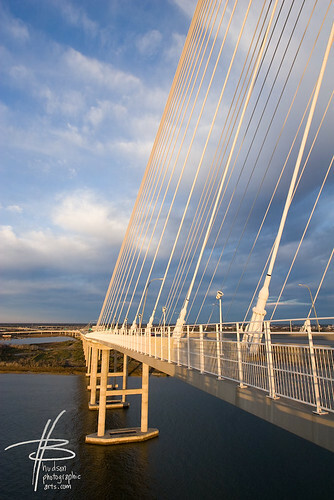 Spanning 1,546 feet, it's the largest cable-stayed bridge in the western hemisphere. Quite a walk from the parking lot, too--one mile to the first pylon. I got there about twenty minutes before daybreak and had just enough time to snap a few long exposures of traffic. It's really interesting to see how a fisheye lens can put an entirely new spin on an old subject. Straight lines, for example, become curvy, flowing patterns that you wouldn't normally see. After the sun broke, I turned around and got some great gold light on the bridge. That's it for now. What do you think of this watermark? I've been signing my initials like this for years and it just dawned on me a few weeks ago that it might make a good logo. 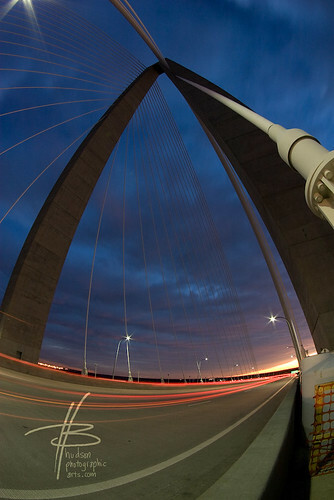 While I do enjoy the fisheye shots, I really like the ones of the sun rising on the bridge. Great work man! I get to Charleston regularly and love the Ravenel Bridge. You have magnificent photos here of it. I'm a friend of Stacey's. I lived in Mount Pleasant for 2 years and love that bridge! Great pics, and I like your watermark! Thanks, Robin! I really enjoy going out there--it's awesome for a morning walk.